Photo: Courtesy of Outdoor Voices.. If you swore off chunky sneakers in the '90s, brace yourself, because the trend is back, and has even started to infiltrate workout shoes. Last week, Outdoor Voices announced its first running-specific collection, which includes apparel like shorts and tanks, plus a running shoe called the OV x Hoka Clifton 4. At first glance, it may seem like Outdoor Voices is just jumping on the chunky sneaker bandwagon, but the thick, shapely sole isn't just for appearance — it can actually be helpful for running. Outdoor Voices collaborated with Hoka One One, the running brand best known for their super-cushioned running shoes with thick soles. "Hoka's original prototypes were designed to make running downhill easier, and one of the key elements of that design was to have lots of cushion, as well as other features that make them stable and supportive," Gretchen Weimer, Global Vice President of Product at Hoka One One says. If you're a beginner runner, you may like the well-cushioned sole, because it provides extra protection, she says. The midsole of the shoe is also curved, which is supposed to help you transition from your heel to your toe when you run, regardless of where you land on your foot. "We want our product to work with runners of all types," she says. I wore the OV x Hoka Clifton 4's on a run through SoHo, and was surprised how cushiony they felt, even on the sidewalk and cobblestone streets. I also wore them on a treadmill hill workout, and they felt supportive and not too clunky. Rebecca Adams, wellness director at Refinery29, said her knees usually get sore easily, but they were totally fine after running in these. "They're also not easy to heel-strike in — because of the shape I think — so they felt smooth to run in," she said. I was expecting the shoe's unique sole to feel like a Sketchers Shape-Up sneaker, but it didn't trip me up at all while on a run. However, I tried to do a strength-training workout in these shoes, and found that the curved sole shifted my center of gravity, which made squatting next to impossible. Rebecca agreed that they're not meant for training. "I can only wear them when I go for a run, not if I'm training in the gym and incorporating movements like squats into my workout," she said. They also felt pretty clunky when I did core exercises on a mat. Despite how cumbersome the shoes look, they were remarkably light, especially compared to other lightweight cushioned running shoes I've worn, like the Brooks Glycerin 15. According to Weimer, Hoka One One decided to get rid of any unnecessary rubber and use less foam when designing these shoes, to ensure that they would be lightweight. (The upper of the shoe is made from a lightweight, breathable fabric, which helps reduce the overall weight as well.) The Clifton 4 design is just as cushioned as some of their other styles of shoes, "but slightly toned down from our original models to save weight and appeal to a broader swath of runners and other consumers," she says. This style of Hoka One One shoes may also attract those of us who also want to look trendy while we run. True to Outdoor Voices style, it's also nice that these bulkier sneakers come in muted colors, like pale blush, mist green, and midnight navy, rather than something aggressively neon and sporty. That means, if you wanted to wear these shoes for fashion alone, you totally could. If you're trying to get into running, or find that you need a lot of cushioning from a running shoe, then these are a great option. At $140, they're not necessarily a bargain, but they are very durable, so you can count on them lasting a really long time. 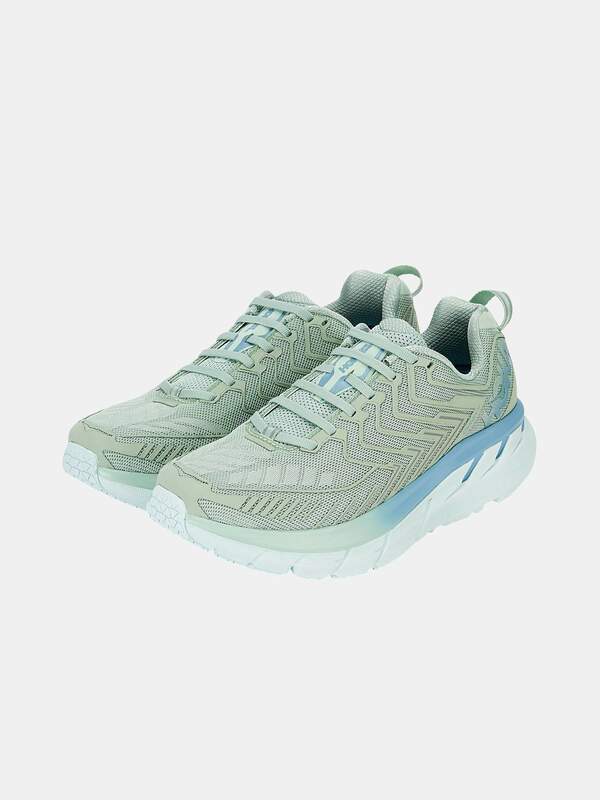 The OV x Hoka Clifton 4 have a pretty specific look, and while it chunky sneaker trend may blow over, they look very comfortable — and comfort is always in style, right?